The 36 unit Y:Cube development in Mitcham, south west London, is an innovative low cost housing initiative for single people in housing need. 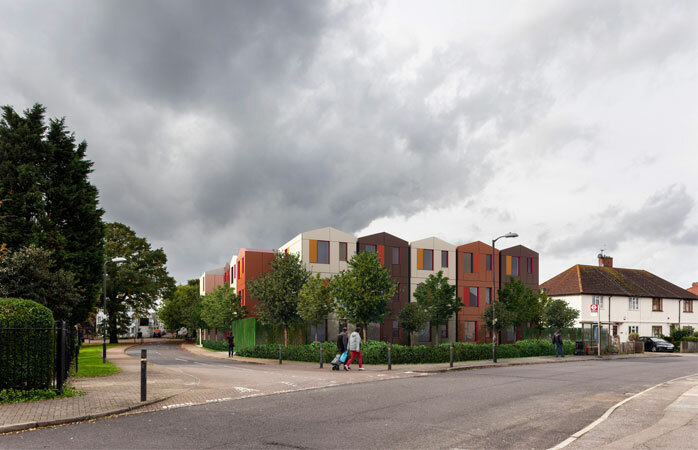 The first UK Y:Cube development, located at the corner of Clay Avenue and Woodstock Way in Mitcham, is a 100% affordable housing scheme providing homes for 36 people in housing need from the local area. All of the 36 flats are currently rented out, with half of the residents coming from YMCA St Paul’s Group’s hostel accommodation, and the other 50% nominated from Merton Council. All tenants will have to be meaningfully engaged in either employment, training, education and volunteering. The referral process will be rigorous to ensure all tenants can live independently and be a good neighbour. The scheme consists of 36 self-contained one bed flats. Each identical flat contains a living space that includes a galley kitchen, separate bedroom and an en-suite toilet and shower. Each flat have a net space of 26sqm. The rent is to be set at or around 65% of the market rent for one bed flat in Merton. All properties will be let on an assured short-hold periodic tenancies with the anticipated length of stay being 3 to 5 years. The scheme will include a housing office and a dedicated housing officer will oversee the tenants and scheme. We want to make sure the tenants are good neighbours and the scheme contributes positively to the local community. The Housing Officer and YMCA will provide a phone number and email address for local people to contact should there be a concern. The Y-Cube project adopts a modern means of construction approach that means the highest building thermal fabric standards can be achieved in a cost effective way. Key to achieving optimum fabric energy efficiency is very high levels of insulation and considerable attention to detail through the design process. The Y-cube construction aims to exceed current building standards and generally achieve very high energy performance levels. In effect, this means that the heating demand for the units is reduced to a practical minimum and the only residual heat demand should be for domestic hot water only. A number of strategies for clean heat delivery are being considered based around adopting the most cost and energy efficient approach. The site will have a mixture of mature and new planting, hard and soft landscaping areas promoting spaces of privacy for the tenants, whilst at the same time encourage community living through grow your zones and external social areas. This is a new housing initiative providing low cost self-contained affordable accommodation for single people in housing need from. Y:Cube Housing is a pre constructed modular system which enables the streamlined units to stack easily on top and/or alongside each other, making it completely adaptable to the size and space available and therefore perfect for tight urban sites. 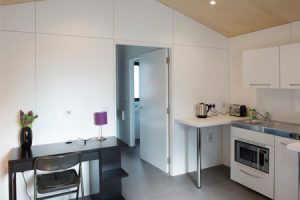 Each unit is constructed from high quality, eco-efficient materials (primarily renewable timber), creating accommodation that is so well insulated, that they require little to no heating, even in winter months. This presents further valuable savings as the cost of energy rises. This initiative is in partnership with architect practice Roger Stirk Harbour + Partners. The build system means the units are fully constructed in a factory in England thus the proposed site is not a traditional building site during the construction process but rather the site is just prepared to accommodate the units, this will minimise noise and disturbance to local residents.